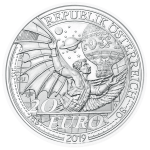 What better way to celebrate one of the most technologically ambitious undertakings of all time with a coin that is technically ambitious in its own right? Combining state-of-the-art concave and convex design, colour application and a glow-in-the-dark effect, our 50th Anniversary of the Moon Landing coin is a fitting tribute to that breathtaking moment in July 1969 when Neil Armstrong became the first person ever to set foot on the moon. One of the most popular and enduring songs of all time celebrates its 200th anniversary in 2018. Silent Night was first performed on Christmas Eve 1818 in the church of St Nicholas in Oberndorf bei Salzburg, Austria. The church was destroyed by flooding in the early 20th century but in its place stands the Silent Night memorial chapel. 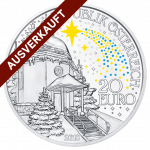 A coloured, glow-in-the-dark star of Bethlehem shines down on the tiny chapel on this fabulously festive Christmas coin. Rounding off the Empress Maria Theresa series, Prudence and Reform, like all the coins in the series, is minted in extra-bold relief and has been inspired by medals issued during the 40-year reign of the Empress. 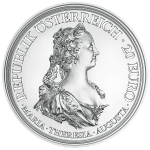 The third coin in our Empress Maria Theresa series features the only ever female ruler of the Habsburg Empire wearing a widow’s veil. Empress Maria Theresa donned the veil following the sudden death of her beloved husband, Francis I, in 1765. Like the other coins in the series, Clemency and Faith has been inspired by medals issued during the Empress’ reign and minted in extra-bold relief, which gives it a special antique look and feel worthy of its illustrious subject. A loving wife, caring mother of 16 children and hard-working absolute ruler, Empress Maria Theresa was the early prototype of the modern multi-tasking woman. 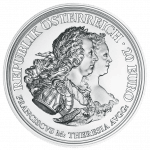 Like the other three Proof quality 20 euro silver coins in our Empress Maria Theresa series, the second coin, Justice and Character, is minted in extra bold relief. 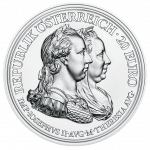 The three-dimensional nature of the series, which celebrates the 300th anniversary of the birth of Maria Theresa in 1717, not only gives each coin a special antique look, but also underlines the multi-faceted role that the Empress played in the history of Austria. The only ever female ruler of the Habsburg Empire, Empress Maria Theresa is the most fascinating female figure in Austrian history. 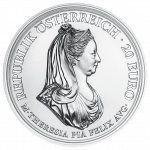 Celebrating the 300th anniversary of her birth in 1717, the four-coin Empress Maria Theresa series is minted in extra bold relief to give each Proof quality 20 euro silver coin a special antique look. Courage and Determination is the superb first coin in the series. The Vienna Philharmonic Orchestra gave what is considered to be its first ever performance on March 28, 1842. 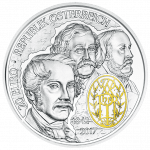 Issued in celebration of the 175th anniversary of that “Grand Concert”, and thus the founding of the Vienna Philharmonic, this splendid coin pays homage to the world famous orchestra and its unique sound. In three great strides this series traverses the eventful life and peerless oeuvre of Wolfgang Amadeus Mozart. 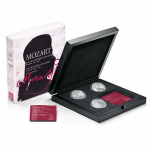 The three coins represent the three acts in Mozart’s life; a life that, through the timelessness of his music, continues long after his death. Not only the most revered composer of all time, Wolfgang Amadeus Mozart was the prototype musical genius who died far too young and became a legend in the aftermath. 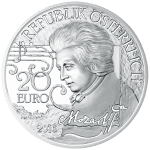 Showing no signs of fading more than two centuries since his death, the Mozart legend is celebrated in the third and final coin in the Austrian Mint’s Wolfgang Amadeus Mozart series. 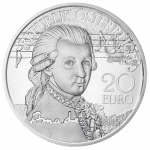 The sublime second coin in the Austrian Mint’s three-coin Mozart series, Amadeus puts the spotlight on Mozart during his adult years. The Vienna music world made him rich, yet he died in debt. But this little gem shows that the music of the greatest composer of all time is priceless. 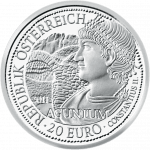 Austrian Mint coins are renowned the world over for their richness of detail. But a unique occasion deserves a unique memento. 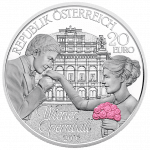 As the Vienna Opera Ball, the highlight of the Vienna Ball season, celebrates its 60th anniversary in 2016, we have now gone a step further by adding printed colour to a coin for the first time. 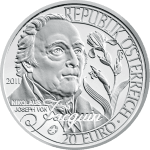 Wolfgang is the first coin in the Austrian Mint’s three-coin series dedicated to Wolfgang Amadeus Mozart, each of which explores a different phase in the short but prolific life of Austria’s most famous son. 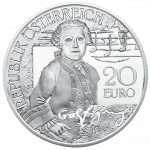 Celebrating Mozart the wunderkind, or child prodigy, this is a very special coin for a very special boy, whose genius lives on more than two centuries after his death. The world’s oldest and most famous equestrian academy celebrates its 450th anniversary in 2015. Considered Intangible Cultural Heritage by UNESCO since 2010, the Spanish Riding School in Vienna continues to delight both connoisseurs and newcomers to horsemanship almost half a millennium since its foundation in 1565. 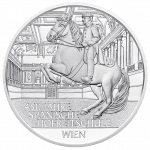 Minted in the school’s honour, this superb 20 euro silver coin brilliantly echoes the elegance of the Spanish Riding School and will no doubt delight you, too. Beginning after an asteroid collided with earth over 65 million years ago, the Tertiary was the period when the Earth started to resemble more closely the planet we inhabit today. The Himalayas, the Alps and the Carpathians, were formed, as was the Mediterranean Sea. The dinosaurs became extinct, but with the development of new habitats early mammals such as elephants, giraffes and big cats came into being. With its massive canine teeth the sabre-toothed cat captures the imagination or strikes fear like no other. 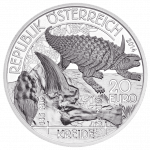 The fourth coin in our Prehistoric Life: Back from the Dead celebrates this magnificent beast in appropriately dramatic fashion. Bordered by the Eastern Bloc for decades, Austria felt the presence of the Iron Curtain far more than most other western countries, and its fall in 1989 was particularly significant to the Austrians. 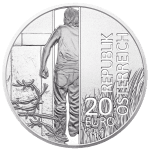 Picturing the decisive events associated with the collapse of the Berlin Wall, this ingenious and resonant silver coin celebrates the 25th anniversary of one of the key events in recent world history. Spanning some 80 million years, the Cretaceous period ended 66 million years ago when an asteroid collided with Earth. The period’s high sea levels meant that large portions of the landmass were under water, but on dry land dinosaurs such as struthiosaurius austriacus thrived. Protected by body armour, this small yet fearsome creature is brought to life on the third coin in our fascinating Prehistoric Life: Back from the Dead series. 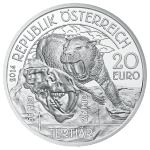 The first coin in our Prehistoric Life: Back from the Dead series, Triassic illustrates the geologic period when all the Earth’s continents were joined together in one vast landmass known as Pangaea. The supercontinent was surrounded by a vast ocean called Panthalassa in whose waters the prehistoric flora and fauna that feature on both sides of this marvellous coin once lived. One of the world’s most popular writers between the two world wars, Austrian Stefan Zweig was also one of the thinkers who helped define the 20th century. 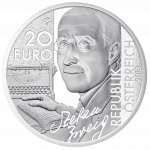 A humanist and pacifist dedicated to making the world a better place, the author and his brilliant novella Chess are celebrated in Austria’s expertly crafted contribution to the European Silver Programme 2013, whose theme is European writers. Built as it was in the twilight years of the Roman Empire, the port of Brigantium is a fitting subject with which to conclude our historic Rome on the Danube series. Rome’s naval prowess may be a somewhat overlooked cog in the empire’s military machine, but this handsome 20 euro silver piece illustrates it in typically splendid fashion. 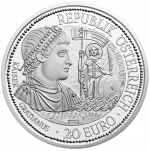 Both a strategic Roman garrison on the Danube and the site of the martyrdom of St Florian, Lauriacum is the penultimate coin in our six-coin Rome on the Danube series. 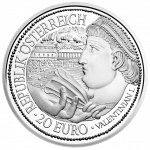 This marvellous 20 euro silver coin celebrates both historical moments in the wonderfully intricate fashion typical of this splendid series. Due to its proximity to the Italian border, Aguntum was one of the earliest Roman settlements in Austria. A thriving centre of commerce and trade founded around 30 BC, Aguntum flourished during the reign of Emperor Constantius II, who features on this elegant fourth addition to our Rome on the Danube series. Back when the mighty Danube was the frontier of the Roman Empire, Carnuntum was the site of Septimius Severus’s declaration as Emperor in AD 193. 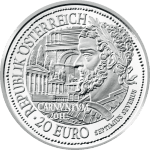 This magnificent third silver 20 euro coin in our Rome on the Danube series does justice to that historic moment. 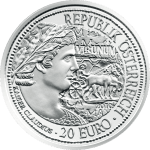 A must for all history enthusiasts and coin collectors alike, Vindobona is the second silver 20 euro coin in our Rome on the Danube series. With unparalleled skill our engravers have brought to life the Roman garrison at its outpost on the frontier of the empire – the city known today as Vienna. In the days when the Romans ruled most of the known world their settlements also controlled modern-day Austria. Virunum, the impressive first in our six-coin Rome on the Danube series, celebrates the capital of the Roman province of Noricum, which covered two thirds of the country. Starting in the past, our odyssey through the 170-year history of Austrian rail has illustrated the important role the country has played in the development of the railway. 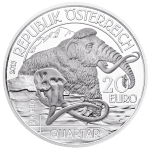 As the sixth and final 20 euro silver coin in the series shows, it will continue to do so in the future. For more than 125 years the electric railway has been providing the most efficient and environmentally friendly means of transport in Austria. 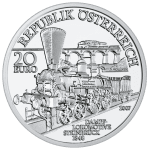 The fifth 20 euro silver coin in our Austrian Railways series pays fitting tribute to the Arlberg Railway, which played a pioneering role in making that electrification happen. Now Austria’s busiest line, the West Railway connects Vienna to Linz and Salzburg. 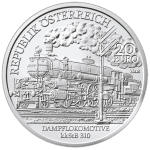 Built in the 1850s and originally named after one of its first and most celebrated passengers, the Empress Elisabeth Railway is the noble fourth 20 euro silver coin in our historic Austrian Railways series. The quarter century of optimism, peace and comfort in Europe before the outbreak of the First World War, the Belle Époque was the period when Vienna was at the forefront of world culture. 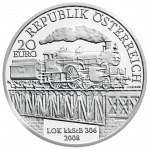 Also the heyday of the age of steam, it is the elegant third 20 euro silver coin in our Austrian Railways series. Connecting landlocked Vienna to the port of Trieste, the Imperial-Royal South Railway was vital to the Habsburg Empire for both trade and tourism. 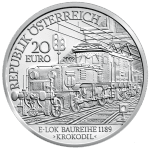 The superb second 20 euro silver coin in our Austrian Railways series charting the history of rail in Austria commemorates the 150th anniversary of the line’s completion in 1857. 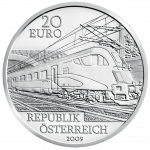 Spanning from the advent of the steam train to the present-day high-speed rail network, Austrian Railways is an enlightening 20 euro silver six-coin series charting the history of rail in Austria. 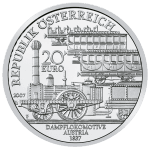 A must for all coin collectors, train buffs and history enthusiasts, the fascinating journey appropriately begins with Emperor Ferdinand’s North Railway, Austria’s first ever line.